You can’t say I’m not looking out for you, friends. Monday I gave you a solid, dependable, and ridiculously awesome mashed potato recipe. Today, I’m here with another essential tool for getting through the holidays looking like a total genius. Get out your pretty pitcher, and stock up on cheap champagne. You’re going to need to be ready to serve a cocktail at the drop of a hat, and this one is sure to please. The Poinsettia comes from my favorite goddess, Nigella Lawson. 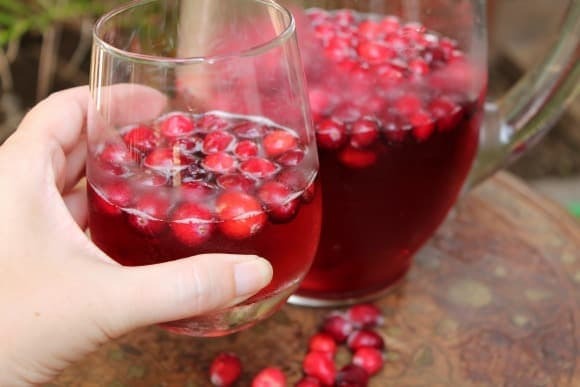 It’s a simple combination of sparkling wine, orange liqueur, and cranberry juice. It’s tastes lovely, but here’s why it’s awesome. You can use cheap champagne because you’re not really going to taste it. I bought a five dollar bottle, and it was fine. Same goes for the orange liqueur. Triple Sec works totally fine here. My favorite part, though, is how you’re going to keep this drink chilled. 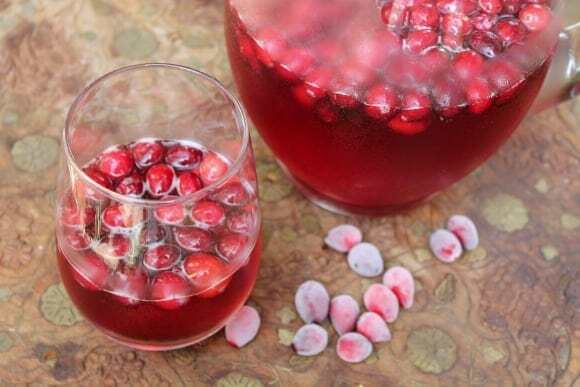 Throw a bag of whole cranberries in your freezer. They’re sure to be easy to find and on sale this time of year. Instead of ice, toss the frozen berries in your pitcher. It will keep your drink cold and look completely beautiful. I also love that you can make a whole pitcher of drinks ahead of time. When your guests get to the bottom of their glasses, it’s much easier to refill from something already mixed than having to make a new drink each time. Plus, the red color just screams holidays. It’s seasonal, beautiful, and cheap. All sorts of win. Invite some friends over. Make them a poinsettia. Eat, drink, and be awesome. The Poinsettia is seasonal, festive, tasty, and cheap. 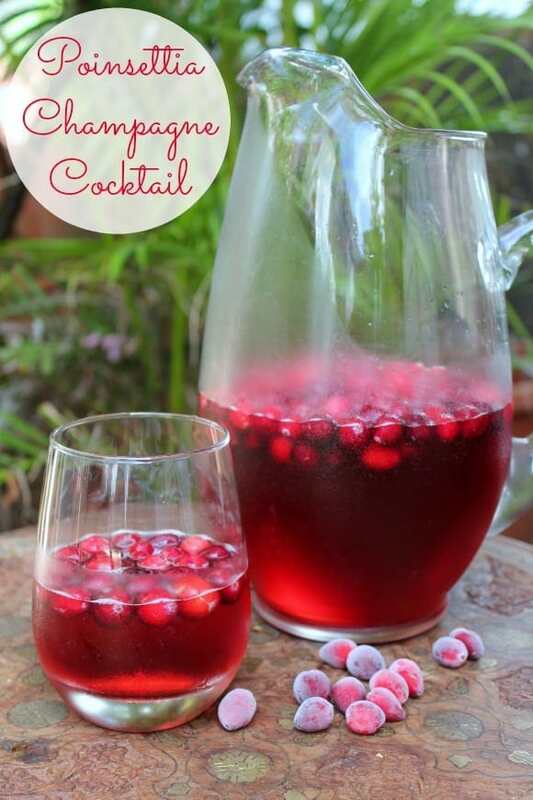 Make up a pitcher for your next holiday party. Combine all ingredients in a pitcher and add frozen berries or ice to keep chilled. Pour into your favorite glasses and enjoy. Thanks for coming and linking up at our Happy Holidays Link Party. We’d love to see you back next week starting Saturdays @7pm ET on The Midnight Baker from now until Christmas! Thanks for coming by. I’ll try to check it out next week!